Value-driven KPIs are critical for adopting and scaling influencer marketing programs. 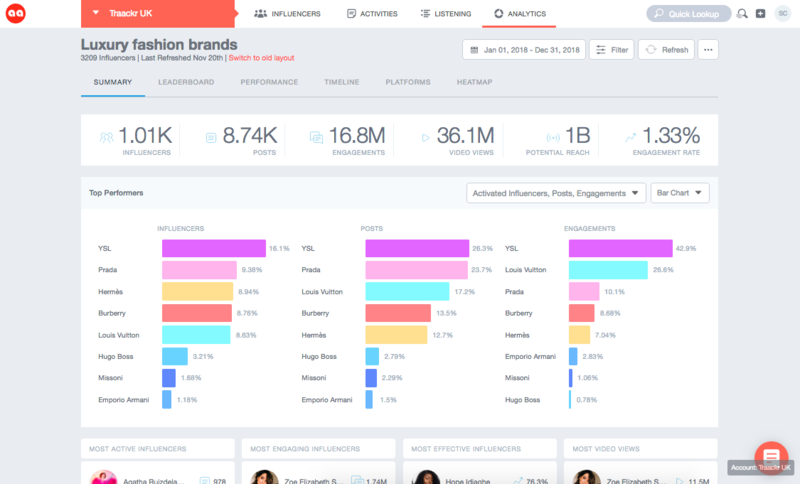 Traackr's Influence Reports help you quantify the value of influencer relationships, by leveraging all measurable metrics around influencer content. This enables you to not only measure how often an influencer talks about your brand but also what quantifiable impact each influencer and each post has on your brand. Is your influencers' audience engaged with their content on a given topic? What types of content resonate the most with your influencers' audience? What channels are most effectively driving engagement? Which influencers are performing the best? How does organic vs sponsored influencer content perform? With this layer of intelligence, you can assess what parts of your program work (or don’t) and in turn improve your strategy and expand your practice. How can I create a new influence report? You can create a new Influence Report for any group of influencers in your account or projects. To create a new Influence Report, go to the Analytics tab and click on "Create Report", and select "Influence Report" from the menu. Define a timeframe for your report by choosing a start date and end date (note you can put an end date in the future to ensure the report will keep on updating). Define the keywords you want to track mentions of. You can enter up to 75 keywords in each keyword group. The groups will match on at least one mention of one of the keywords in the group, allowing you to compare a share of voice against other groups of keywords. Select which influencers you want to track in the report by applying the relevant filters (optional). By clicking 'On', you can then select groups of influencers by projects, tags, relationship stages, or relationship owners. The report wizard will then show you how many influencers match these filters and will be part of your report. Finally, in 'Privacy' you have the option of creating shareable reports for colleagues who may not be Traackr users. You'll be able to make any reports shareable that you already have set up, or have the option of making this new one shareable too. You just need to toggle on 'Shareable Link' and set an expiration date. Then click "Save Reports" to launch the report. Depending on the size of the report, it may take some time to generate. For reports that will take longer than one minute, we will send you an email once it is ready. How can I quickly see my campaign or brand results? The "Summary" page provides a quick overview of the main KPIs and results from your report keywords. If you've set up a single keyword group (eg for a campaign), you will see a timeline chart showing posts over time. Otherwise, you will have a share of voice report for the Top Performers amongst your brands. The main KPIs at the top are a quick and easy way to get the headline figures for your results. 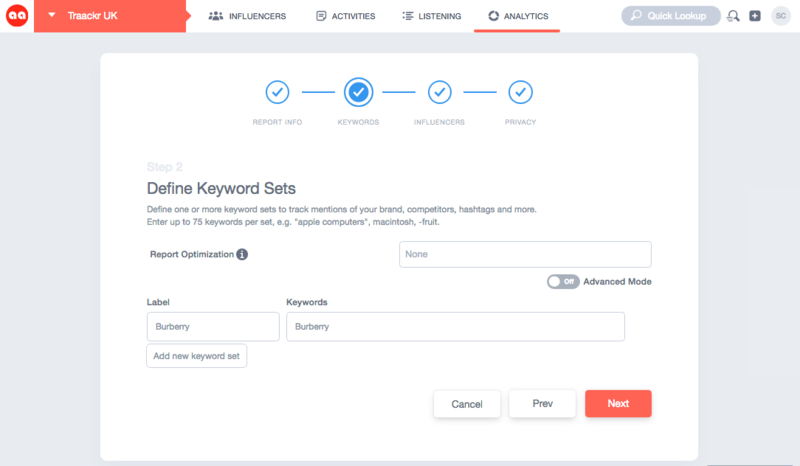 The default view will show you which keywords or brands have performed best in terms of numbers of influencers who've mentioned them, total posts, and total engagements. You can also customize this view to select the metrics most of interest to you, also including video views, potential reach, and engagement rate. Clicking on the "Filters" box allows you to select content just by particular keywords, platforms etc. Scrolling down will show you the top performing influencers, as well as visual display of the top performing posts.